The 5th Annual Gumbo Cook-off and Zydeco Party will be during this 2nd Friday Artwalk at STASH’s Annex January 8, 2016 from 6-9pm. Cost is $10 to vote for best among many gumbo, drinks, and music from the Zydeco Allstars, including new sponsors Jax Soul Kitchen and The Brewhouse. Proceeds benefit the parade and Friends of Animals in Norman (FAN). 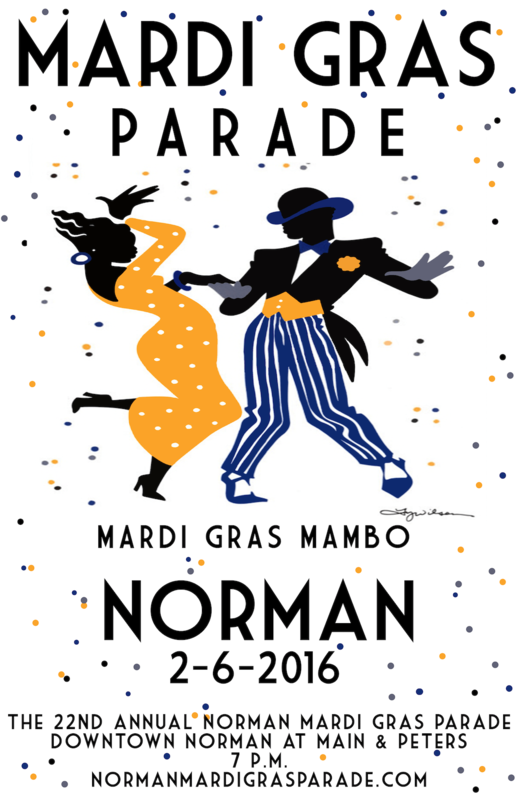 The 22nd Annual Norman Mardi Gras Parade will be on Friday, February 6, 2016 in Downtown Norman from 7-8 pm. It is Norman’s only night parade and Oklahoma’s original mardi gras parade. The 2016 Theme is Mardi Gras Mambo! It is family friendly and bands are highly encouraged to participate, so are invited to enter for free! The event will roll in cold weather and is still expected to have some 4,000 spectators downtown to enjoy the fun. Bands, animal entries, gumbo winners, sponsors, and royalty roll for free. Final proceeds benefit Friends of Animals in Norman (FAN). For more Mardi Gras events, check out the Mardi Gras guide.